Does God speak to us? Yes, through His Word! 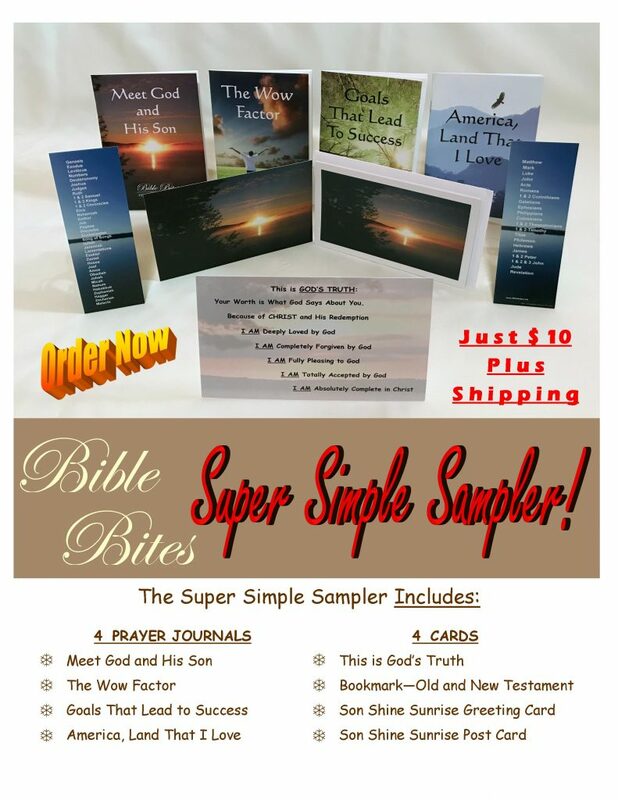 If you are intimidated by the Bible (the best-selling book of all time) try Bible Bites. You’ll find it easy to read just one verse daily and journal your response to that one single verse. Then learn to wait for God’s best answer which may be different from your desired answer. Does God answer prayer? YES: Definitely – Denied – Delayed – Differently – Distributed a bit at a time. When we work, we work. WHEN WE PRAY, GOD WORKS. So what are you waiting for? You know you want your prayers answered! Shop now to order the Super Simple Sampler for your friends, family AND yourself! Scroll down below the products picture. Click ADD TO CART. Just $10.00 for each Sampler Set! VIEW CART automatically appears. Add your ship to address and proceed to payment! Supplies are Limited! Orders will be shipped USPS Priority Mail.